I'm always keeping an eye out for handmade gift ideas. If you caught Martha Stewart's "Baby Shower" episode last week then you saw this adorable DIY idea–which turns hooks into animal tails. The safari theme is so popular for nurseries, you're sure to find an occasion to make it. 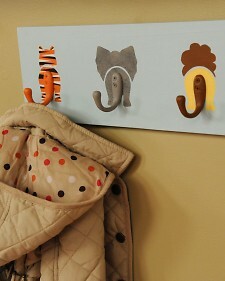 It also could be used on the back of a bathroom door, playroom or mudroom. Find the tutorial here. Templates are even provided.